You can recognize the bus in this picture, even though it is distorted, because of that iconic color. It was chosen in 1939 and used all over America. Later, people found out that while the shade was great, the chemistry left something to be desired. Here’s how school buses got covered in poison. Why “chrome”? Because the paint was made with chromium. This wasn’t strange. A lot of paints are made with chromium. This brittle, colorless metal combines with other elements to make an amazing array of pigments. Go to the paint aisle in an art supply shop and you’ll find everything from “chromium yellow” to “chromium blue.” In fact chromium first came to the world’s attention because it was part of a compound known as “Siberian red lead.” That name gives us the first clue as to why people decided, a few decades later, that the formula for school bus paint had to change. National School Bus Chrome was a lead-based paint. 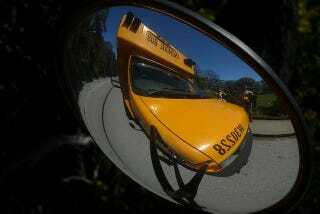 Worse yet, National School Bus Chrome contained a kind of chromium known as hexavalent chromium. Hexavalent chromium has had six of its electrons ripped off of it. With a +6 charge, it is hungry for electrons and will borrow some from whatever is nearby, including the structures in living cells. Hexavalent chromium will damage DNA. Exposure to it will lead to mutations and to cancer. Although any exposure can be dangerous, hexavalent chromium seems to do the most damage when it’s inhaled. Lung tissue is delicate, and the breathing in the compound exposes a lot of tissue. This means that School Bus Chrome probably did more damage to the people manufacturing the paint and painting the school buses than the kids riding insides the buses. Still, it’s not something that anyone wants to expose their kids to. Today’s buses have kept the yellow color, but have changed the formula for producing it.